Club Lotus Portugal: O fim de uma era. Mike Kimberley anunciou hoje que vai deixar o cargo de CEO do Group Lotus, por problemas de saúde. Um Comité Executivo, suportado pelo principal accionista Proton, vai assumir as decisões do grupo, até um sucessor ser encontrado. Mike, de 71 anos, está intimamente ligado à Lotus, tendo iniciado a sua carreira na marca no longínquo ano de 1969. 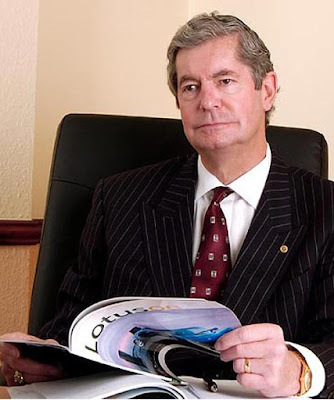 The Chief Executive of Group Lotus, Mike Kimberley, announced today that he is stepping down from his role due to an ongoing back problem. An Executive Committee comprising current Group Lotus board members supported by the shareholder, Proton Holdings Bhd, will assume day-to-day control of the business until a successor is appointed. Mike, who will be 71 in August, has been suffering from severe back pain for a number of months and underwent surgery in late 2008 which was only partially successful. His doctors have now advised him to retire so as not to jeopardize his long term health. Under these circumstances, the board has regretfully accepted his resignation. Under Mike’s leadership, Lotus has produced the award-winning Lotus Evora, which was recently launched to the world’s press with universal acclaim. He has also overseen the expansion of Lotus Engineering, one of the world’s most respected high-technology engineering consultancy businesses. Group Lotus now has a positive and stable platform despite the global economic downturn and is delivering against its defined growth targets in the company’s strategic business plan. Mike will leave Lotus on 17 July 2009.